"I Want To Repeat Clearly" – On Amoris, The Pope's "Dominic Option"
Almost 18 months since the publication of Amoris Laetitia, a fresh round of skirmishes mounted over last weekend as a group of 62 clerics and lay scholars issued a 25-page "filial correction" of the Pope, charging seven instances of "words, deeds and omissions" of Francis' which, they said, have "serve[d] to propagate... heretical propositions." 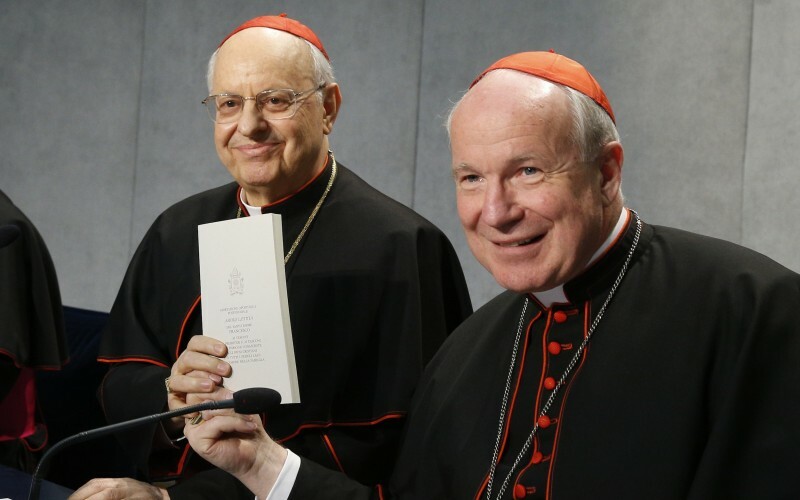 Between the new document and the prior dubia over Amoris submitted last year by four cardinals – two of whom have since died – a central argument of the efforts' champions has been that Papa Bergoglio has further manifested the alleged "errors" by not answering the claims against him. 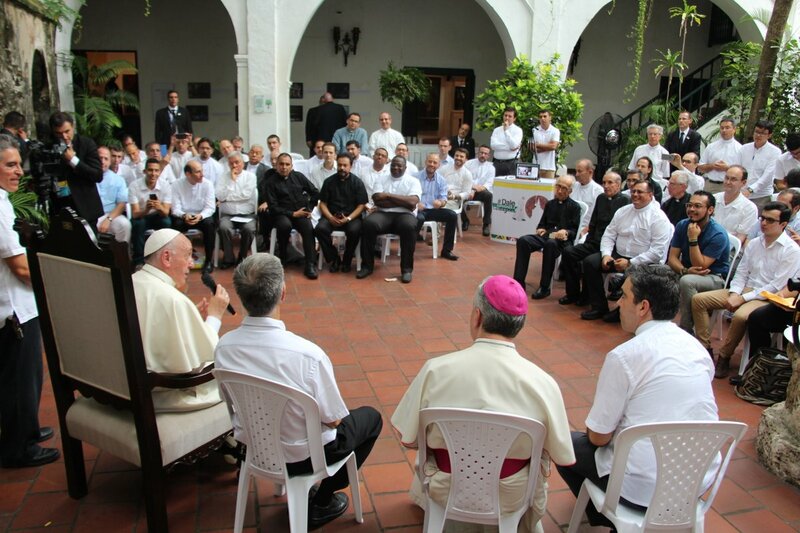 Yet during his standard informal meetup with his fellow Jesuits (above and below) during his trek to Colombia earlier this month – its transcript only revealed this morning by the Society's Italian journal, La Civiltà Cattolica – Francis delivered his clearest reply to date. So, philosophy not in a laboratory, but in life, in dialogue with reality. In dialogue with reality, philosophers will find the three transcendentals that constitute unity, but they will have a real name. Recall the words of our great writer Dostoyevsky. Like him we must reflect on which beauty will save us, on goodness, on truth. Benedict XVI spoke of truth as an encounter, that is to say no longer a classification, but a road. Always in dialogue with reality, for you cannot do philosophy with a logarithmic table. Besides, nobody uses them anymore. The same is true for theology, but this does not mean to corrupt theology, depriving it of its purity. Quite the opposite. The theology of Jesus was the most real thing of all; it began with reality and rose up to the Father. It began with a seed, a parable, a fact... and explained them. Jesus wanted to make a deep theology and the great reality is the Lord. I like to repeat that to be a good theologian, together with study you have to be dedicated, awake and seize hold of reality; and you need to reflect on all of this on your knees. A man who does not pray, a woman who does not pray, cannot be a theologian. They might be a living form of Denzinger, they might know every possible existing doctrine, but they’ll not be doing theology. They’ll be a compendium or a manual containing everything. But today it is a matter of how you express God, how you tell who God is, how you show the Spirit, the wounds of Christ, the mystery of Christ, starting with the Letter to the Philippians 2:7.... How you explain these mysteries and keep explaining them, and how you are teaching the encounter that is grace. As when you read Paul in the Letter to the Romans where there’s the entire mystery of grace and you want to explain it. I’ll use this question to say something else that I believe should be said out of justice, and also out of charity. In fact I hear many comments – they are respectable for they come from children of God, but wrong – concerning the post-synod apostolic exhortation. To understand Amoris Laetitia you need to read it from the start to the end. Beginning with the first chapter, and to continue to the second and then on ... and reflect. And read what was said in the Synod. A second thing: some maintain that there is no Catholic morality underlying Amoris Laetitia, or at least, no sure morality. I want to repeat clearly that the morality of Amoris Laetitia is Thomist, the morality of the great Thomas. You can speak of it with a great theologian, one of the best today and one of the most mature, Cardinal Schönborn. As for an elucidation of the answer, of course, this isn't the first occasion on which Francis has highlighted Schönborn, now the Dominican archbishop of Vienna who, as a 41 year-old professor, was tapped by then-Cardinal Joseph Ratzinger as principal editor of what would become the Catechism of the Catholic Church – the first universal volume of its kind since Trent – overseeing a daunting six-year process which drew input from two millennia of texts and a cast of thousands, including all the bishops of the world. In a foreshadowing snub of his since-deposed CDF prefect, the current pontiff instead tapped the Austrian to present Amoris on the day of its release (above) in the Vatican Press Office, a choice that came after Schönborn reportedly navigated the sole German-speaking group at the 2015 Synod (which, for clarity, indeed included Cardinal Gerhard Müller) to adopt a "unanimous" consensus for a case-by-case "discernment" on the integration of civilly remarried couples. The agreed-to framework was modeled on a five-point examen the cardinal – himself a child of divorce – had previously devised in Vienna. While Schönborn re-sketched the concept in a subsequent conversation with Civiltà's editor – the papal confidant Fr Antonio Spadaro – in mid-July the cardinal gave his most extensive treatment on the document, including its most contested piece, in English at a conference on family life in Ireland ahead of next summer's World Meeting of Families in Dublin, which Francis is all but officially confirmed to attend. For Oklahoma, and Beyond, A Blessed "Shepherd"
Out in the Plains, this Saturday morning brings a historic moment for the Stateside Church – the first major beatification to take place on American soil, and of the nation's first declared martyr at that. 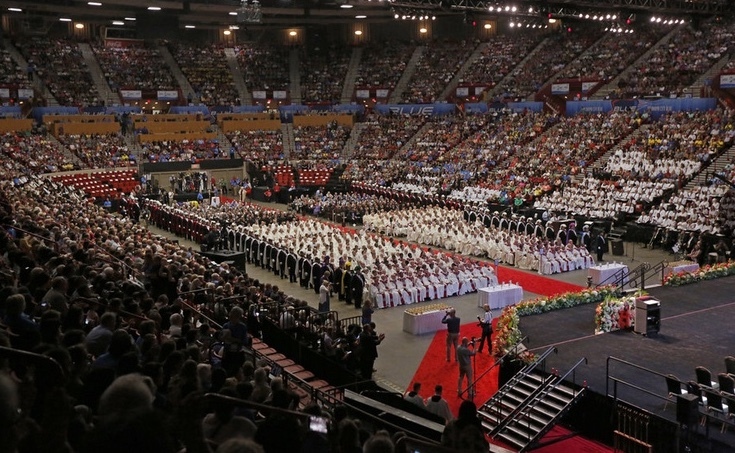 Beginning at 10am Central (11am ET, 5pm Rome) in Oklahoma City's 15,000-seat Cox Convention Center, the Mass declaring Fr Stanley Francis Rother (right) among the ranks of the Blessed will be celebrated by the Vatican's Saintmaker-in-Chief, Cardinal Angelo Amato, serving per usual as the papal legate for the occasion. Though one earlier instance of the step before sainthood has taken place in the US since the rites were returned to the local churches by then-Pope Benedict XVI in 2005, the 2014 liturgy in Newark that elevated a Bayonne-born nun as Blessed Miriam Teresa Demjanovich garnered far less prominence than the cause of Rother, a missionary in Guatemala who was murdered in 1981 by a guerrilla death squad. Today's Mass is the first of two beatifications taking place in the US over the coming weeks: on 18 November, the Capuchin Fr Solanus Casey will be raised to the rank in a massive ceremony to be held at Ford Field, the 60,000-seat NFL stadium in his hometown of Detroit. Back to Rother, it bears recalling that – as beatification provides solely for the veneration of a person on the local level – the celebration of the new Blessed's feast on the July 28th anniversary of his martyrdom will initially be restricted to the archdiocese of Oklahoma City alone. Should a critical mass of petitions from other US bishops arise, the USCCB may proceed to placing the feast on the national calendar, with an affirmative vote from the bench subject to recognitio by the Holy See. where the brave Shepherd has gone before. 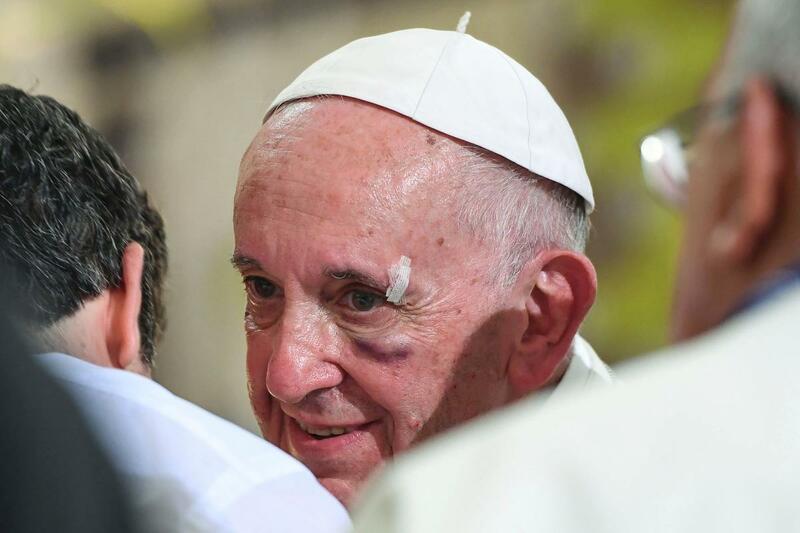 "Please, I Ask You For Passion" – On the Church as "Sacrament of Unity, Sacrament of Hope"
Like it or not, as the enduring image of last week's five-day trek to Colombia will end up being the shiner to Francis' left eye after a sudden Popemobile stop, given his quick rebound from the head-bump, the old Timex watch slogan comes to mind: in this case, "He takes a licking and keeps on ticking." Then again, considering the daily bruising to which he's openly subjected – just from within the church – you already knew that. Back to the present, while the Colombia tour brought its usual share of the now-expected evocative and freewheeling reflections, on the programmatic front, one address in particular stands out. So even for the usual input overload these visits tend to be in the moment, for the long haul, it's important that it not be lost in the sea of all the rest. For the wider world – and, indeed, the host-nation itself – the trip's main emphasis was on reconciliation, in light of last year's hard-won peace accord which ended the decades-long scourge of violence by left-wing guerrillas. In church terms, however, the core element lay elsewhere, its ramifications likely to spread across the continent and beyond. 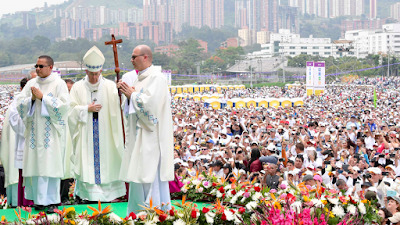 One of global Catholicism's five largest outposts – at least until 2002, when three additional dioceses were spun off from it – today's "downsized" see of Bogotá still comprises some 4 million members. In more ways than one, though, on the continent which claims a plurality of the worldwide fold of 1.2 billion, Colombia's lead metropolis is the de facto capital of the Latin American church; a distinction first born from the country’s historic standing as a bastion of learning and culture, but now owed in particular to Bogotá’s place as the headquarters of CELAM – the mega-conference of the region’s 1,500-odd bishops. In all, CELAM encompasses the 21 national benches of Latin America and the Caribbean, which between them lead some 500 million faithful. Yet while each country retains its own proper conference, to view the wider body as some kind of weak confederation would be a grave mistake – if anything, it’s the closest thing the global church has to a ministry lab, policy shop and megaphone at the broadest possible level, and this pontificate has only served to amplify its unique role all the more. Interestingly enough, on the death of the retired English prelate Cardinal Cormac Murphy-O’Connor earlier this month, the insight resurfaced that the now widely-known “St Gallen group” of progressive red-hats committed to Vatican II’s call for enhanced collegiality only saw its inception after John Paul II’s Curia sought to clip the wings of CELAM and its less-formidable European counterpart, the CCEE. 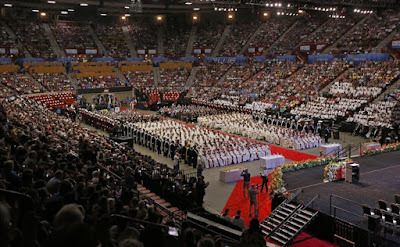 As circumstances would have it, though, the 2013 Conclave saw the pendulum swing their way: in the watershed choice of the primate of Argentina, the lead architect of the Latin American bishops’ current operative charter – built upon the concept of a church in “a permanent state of mission” – garnered the mandate to bring the rest of the global fold under its umbrella. Six years after the now-Pope led the drafting of said Message at Aparecida, Francis’ universal adaptation of it came in Evangelii gaudium – then as now, the blueprint of his ministry as the church's "Supreme Pastor." Accordingly, just as the preview of that overarching program was shared at Rio de Janiero months after his election during an address to CELAM’s leadership, so last week in Bogotá, another major talk to the conference’s summoned top brass serves as both a progress-check and an eye to what’s ahead. In that light, a couple context notes bear recalling. 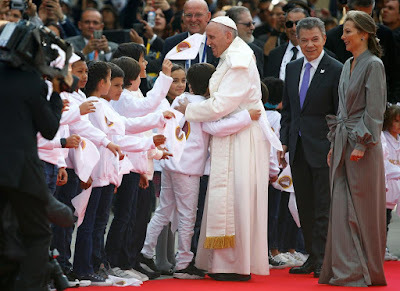 First, when it comes to Papa Bergoglio’s ideal of a more synodal church at every level – most palpably expressed by him on the 50th anniversary of the Roman Synod in 2015 – for Francis, the Latin conference is the template which best embodies the goal. It was CELAM, after all, which made the imperative of “the preferential option for the poor” not just part of the lexicon of the modern church, but one which has bled into wider society. 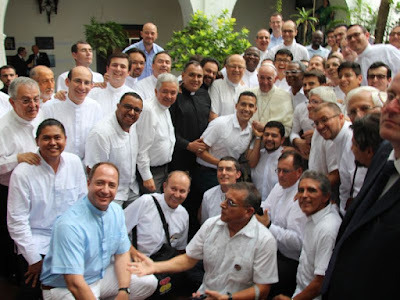 And lastly, while Francis himself mused to his old confreres that "the treasure of Aparecida" remains "to be fully exploited," it is curious that – with CELAM essentially toting a blank check for whatever it wants from Rome these days – seemingly no groundwork has yet been plotted for a next plenary of the entire Latin American episcopate, which have tended to occur roughly every decade and a half. Convoked by the Pope at the behest of the body, then with several more years spent in preparation, the five CELAM assemblies have each served to reorient a continent-wide church around a shared vision and set of general priorities. While that’s no small feat in itself, given a Stateside church whose present and future are driven more from points South than East, what ensues on that front in due course will have an unprecedented effect above the Rio Grande – a state of affairs which only grows with each passing day. All that said, marking an opening to some interesting possibilities – at least, if its operative word is heeded – as delivered last week at the Bogotá Nunciature, here’s the full English (emphases original) of Francis’ “Blueprint 2.0,” intended both for his home-turf and far afield. I thank you for our meeting and for the warm words of welcome by the President of the Latin American Episcopal Council. Were it not for the tight demands of my schedule, I would have liked to visit you at the CELAM offices. I thank you for your thoughtfulness in meeting me here. I appreciate your efforts to make this continental Episcopal Conference a home at the service of communion and the mission of the Church in Latin America, as well as a centre for fostering a sense of discipleship and missionary spirit. Over these decades of service to communion, CELAM has also become a vital point of reference for the development of a deeper understanding of Latin American Catholicism. I take this occasion to encourage your recent efforts to express this collegial concern through the Solidarity Fund of the Latin American Church. Four years ago, in Rio de Janeiro, I spoke to you about the pastoral legacy of Aparecida, the last synodal event of the Church in Latin America and the Caribbean. I stressed the continuing need to learn from its method, marked in essence by the participation of the local Churches and attuned to God’s pilgrim people as they seek his humble face revealed in the Virgin fished from the waters. That method is also reflected in the continental mission, which is not meant to be a collection of programmes that fill agendas and waste precious energies. Instead, it is meant to place the mission of Jesus at the heart of the Church, making it the criterion for measuring the effectiveness of her structures, the results of her labours, the fruitfulness of her ministers and the joy they awaken. For without joy, we attract no one. I went on to mention the ever-present temptations of making the Gospel an ideology, ecclesial functionalism and clericalism. At stake is the salvation that Christ brings us, which has to touch the hearts of men and women by its power and appealing to their freedom, inviting them to a permanent exodus from themselves and their self-absorption, towards fellowship with God and with our brothers and sisters. When God speaks to us in Jesus, he does not nod vaguely to us as if we were strangers, or deliver an impersonal summons like a solicitor, or lay down rules to be followed like certain functionaries of the sacred. God speaks with the unmistakable voice of the Father to his children; he respects the mystery of man because he formed us with his own hands and gave us a meaningful purpose. Our great challenge as a Church is to speak to men and women about this closeness of God, who considers us his sons and daughters, even when we reject his fatherhood. For him, we are always children to be encountered anew. The Gospel, then, cannot be reduced to a programme at the service of a trendy gnosticism, a project of social improvement or the Church conceived as a comfortable bureaucracy, any more than she can be reduced to an organization run according to modern business models by a clerical caste. The Church is the community of Jesus’ disciples. The Church is a Mystery (cf. Lumen Gentium, 5) and a People (cf. ibid., 9). Better yet, in the Church the Mystery becomes present through God’s People. Hence my insistence that missionary discipleship is a call from God for today’s busy and complicated world, a constant setting out with Jesus, in order to know how and where the Master lives. When we set out with him, we come to know the will of the Father who is always waiting for us. Only a Church which is Bride, Mother and Servant, one that has renounced the claim to control what is not her own work but God’s, can remain with Jesus, even when the only place he can lay his head is the cross. Closeness and encounter are the means used by God, who in Christ has drawn near to us to continually meet us. The mystery of the Church is to be the sacrament of this divine intimacy and the perennial place of this encounter. Hence, the need for the bishop to be close to God, for in God he finds the source of his freedom, his steadfastness as a pastor and the closeness of the holy people entrusted to his care. In this closeness, the soul of the apostle learns how to make tangible God's passion for his children. Aparecida is a treasure yet to be fully exploited. I am certain that each of you has seen how its richness has taken root in the Churches you hold in your hearts. Like the first disciples sent forth by Jesus on mission, we too can recount with enthusiasm all that we have accomplished (cf. Mk 6:30). Nonetheless, we have to be attentive. The essential things in life and in the Church are never written in stone, but remain a living legacy. 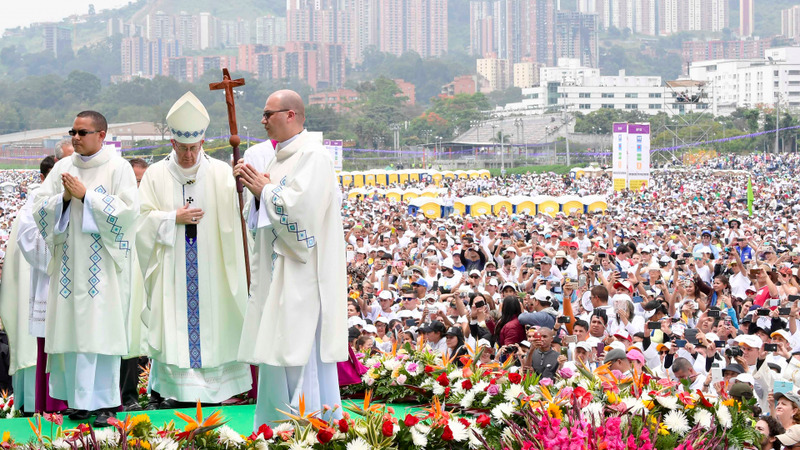 It is all too easy to turn them into memories and anniversaries to be celebrated: fifty years since Medellín, twenty since Ecclesia in America, ten since Aparecida! Something more is required: by cherishing the richness of this patrimony (pater/munus) and allowing it to flourish, we exercise the munus of our episcopal paternity towards the Church in our continent. As you well know, the renewed awareness born of an encounter with the living Christ requires that his disciples foster their relationship with him; otherwise, the face of the Lord is obscured, the mission is weakened, pastoral conversion falters. To pray and to foster our relationship with him: these are the most essential and urgent activities to be carried out in our pastoral mission. When the disciples returned excited by the mission they had carried out, Jesus said to them: “Come away by yourselves to a lonely place” (Mk 6:31). How greatly we need to be alone with the Lord in order to encounter anew the heart of the Church’s mission in Latin America at the present time. How greatly we need to be recollected, within and without! Our crowded schedules, the fragmentation of reality, the rapid pace of our lives: all these things might make us lose our focus and end up in a vacuum. Recovering unity is imperative. Where do we find unity? Always in Jesus. What makes the mission last is not the generosity and enthusiasm that burn in the heart of the missionary, even though these are always necessary. It is rather the companionship of Jesus in his Spirit. If we do not we set out with him on our mission, we quickly become lost and risk confusing our vain needs with his cause. If our reason for setting out is not Jesus, it becomes easy to grow discouraged by the fatigue of the journey, or the resistance we meet, by constantly changing scenarios or by the weariness brought on by subtle but persistent ploys of the enemy. It is not part of the mission to yield to discouragement, once our initial enthusiasm has faded and the time comes when touching the flesh of Christ becomes very hard. In situations like this, Jesus does not feed our fears. We know very well that to him alone can we go, for he alone has the words of eternal life (cf. Jn 6:68). So we need to understand and appreciate more deeply the fact that he has chosen us. Concretely, what does it mean to set out on mission with Jesus today, here in Latin America? The word “concretely” is not a mere figure of speech: it goes to the very heart of the matter. The Gospel is always concrete, and never an exercise in fruitless speculation. We are well aware of the recurring temptation to get lost in the cavils of the doctors of the law, to wonder how far we can go without losing control over our own bailiwick or our petty portion of power. 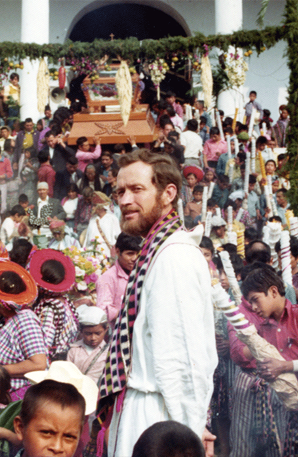 We often hear it said that the Church is in a permanent state of mission. Setting out with Jesus is the condition for this. Setting out, yes, but with Jesus. The Gospel speaks of Jesus who, having proceeded from the Father, journeys with his disciples through the fields and the towns of Galilee. His journeying is not meaningless. As Jesus walks, he encounters people. When he meets people, he draws near to them. When he draws near to them, he talks to them. When he talks to them, he touches them with his power. When he touches them, he brings them healing and salvation. His aim in constantly setting out is to lead the people he meets to the Father. We must never stop reflecting on this and examining our consciences. The Church has to re-appropriate the verbs that the Word of God conjugates as he carries out his divine mission. To go forth to meet without keeping a safe distance; to take rest without being idle; to touch others without fear. It is a matter of working by day in the fields, where God’s people, entrusted to your care, live their lives. We cannot let ourselves be paralyzed by our air-conditioned offices, our statistics and our strategies. We have to speak to men and women in their concrete situations; we cannot avert our gaze from them. The mission is always carried out by one to one contact. What lack of focus we see all around us! I am referring not only to the squandering of our continent’s rich diversity, but also to a constant process of disintegration. We need to be attentive lest we let ourselves fall into these traps. The Church is not present in Latin America with her suitcases in hand, ready, like so many others over time, to abandon it after having plundered it. Such people look with a sense of superiority and scorn on its mestizo face; they want to colonize its soul with the same failed and recycled visions of man and life; they repeat the same old recipes that kill the patient while lining the pockets of the doctors. They ignore the deepest concerns present in the heart of its people, the visions and the myths that give strength in spite of frequent disappointments and failures. They manipulate politics and betray hopes, leaving behind scorched land and a terrain ready for more of the same, albeit under a new guise. Powerful figures and utopian dreams have promised magic solutions, instant answers, immediate effects. The Church, without human pretensions, respects the varied face of the continent, which she sees not as an impediment but rather a perennial source of wealth. She must continue working quietly to serve the true good of the men and women of Latin America. She must work tirelessly to build bridges, to tear down walls, to integrate diversity, to promote the culture of encounter and dialogue, to teach forgiveness and reconciliation, the sense of justice, the rejection of violence. No lasting construction in Latin America can do without this unseen yet essential foundation. The Church appreciates like few others the deep-rooted shared wisdom that is the basis of every reality in Latin America. She lives daily with that reserve of moral values on which the life of the continent rests. I am sure that, even as I say this, you can put a name on this reality. We must constantly be in dialogue with it. We cannot lose contact with this moral substratum, with this rich soil present in the heart of our people, wherein we see the subtle yet eloquent elements that make up its mestizo face – not merely indigenous, Hispanic, Portuguese or African, but mestizo: Latin American! Guadalupe and Aparecida are programmatic signs of the divine creativity that has bought this about and that underlies the popular piety of our people, which is part of its anthropological uniqueness and a gift by which God wants our people to come to know him. The most luminous pages of our Church’s history were written precisely when she knew how to be nourished by this richness and to speak to this hidden heart. For it guards, like a small spark beneath a coat of ashes, the sense of God and of his transcendence, a recognition of the sacredness of life, respect for creation, bonds of human solidarity, the sheer joy of living, the ability to find happiness without conditions. To speak to this deepest soul, to speak to the most profound reality of Latin America, the Church has no other way than to continually learn from Jesus. The Gospel tells us that he spoke only in parables (cf. Mk 4:34). He used images that engaged those who heard his word and made them characters in his divine stories. God’s holy and faithful people in Latin America understand no other way of speaking about him. We are called to set out on mission not with cold and abstract concepts, but with images that keep multiplying and unfolding their power in human hearts, making them grain sown on good ground, yeast that makes the bread rise from the dough, and seed with the power to become a fruitful tree. Many people decry a certain deficit of hope in today’s Latin America. We cannot take part in their “moaning”, because we possess a hope from on high. We know all too well that the Latin American heart has been taught by hope. As a Brazilian songwriter has said, “hope dances on the tightrope with an umbrella” (João Bosco, O Bêbado e a Equilibrista). Once you think hope is gone, it returns where we least expect it. Our people have learned that no disappointment can crush it. It follows Christ in his meekness, even under the scourge. It knows how to rest and wait for the dawn, trusting in victory, because – deep down – it knows that it does not belong completely to this world. The Church in these lands is, without a doubt and in a special way, a sacrament of hope. Still, there is a need to watch over how that hope takes concrete shape. The loftier it is, the more it needs to be seen on the faces of those who possess it. In asking you to keep watch over the expression of hope, I would now like to speak of some of its traits that are already visible in the Latin American Church. We often speak of young people and we often hear statistics about ours being the continent of the future. Some point to supposed shortcomings and a lack of motivation on the part of the young, while others eye their value as potential consumers. Others would enlist them in drug trafficking and violence. Pay no attention to these caricatures of young people. Look them in the eye and seek in them the courage of hope. It is not true that they want to return to the past. Make real room for them in your local Churches, invest time and resources in training them. Offer them incisive and practical educational programmes, and demand of them, as fathers demand of their children, that they use their gifts well. Teach them the joy born of living life to the full, and not superficially. Do not be content with the palaver and the proposals found in pastoral plans that never get put into practice. I purposely chose Panama, the isthmus of this continent, as the site of the 2019 World Youth Day, which will propose the example of the Virgin Mary, who speaks of herself as a servant and is completely open to all that is asked of her (cf. Lk 1:38). I am certain that in all young people there is hidden an “isthmus”, that in the heart of every young person there is a small strip of land which can serve as a path leading them to a future that God alone knows and holds for them. It is our task us to present the young with lofty ideals and to encourage them to stake their lives on God, in imitation of the openness shown by Our Lady. I need not dwell on the role of women on our continent and in our Church. From their lips we learned the faith, and with their milk we took on the features of our mestizo soul and our immunity to despair. I think of indigenous or black mothers, I think of mothers in our cities working three jobs, I think of elderly women who serve as catechists, and I think of consecrated woman and those who quietly go about doing so much good. Without women, the Church of this continent would lose its power to be continually reborn. It is women who keep patiently kindling the flame of faith. We have a grave obligation to understand, respect, appreciate and promote the ecclesial and social impact of all that women do. They accompanied Jesus on his mission; they did not abandon him at the foot of the cross; they alone awaited for the night of death to give back the Lord of life; they flooded the world with the proclamation of his risen presence. If we hope for a new and living chapter of faith in this continent, we will not get it without women. Please, do not let them be reduced to servants of our ingrained clericalism. For they are on the front lines of the Latin American Church, in their setting out with Jesus, in their persevering amid the sufferings of their people, in their clinging to the hope that conquers death, and in their joyful way of proclaiming to the world that Christ is alive and risen. I would like to repeat something I recently said to the Pontifical Commission for Latin America. It is imperative to overcome the clericalism that treats the Christifideles laici as children and impoverishes the identity of ordained ministers. Though much effort has been invested and some steps have been taken, the great challenges of the continent are still on the table. They still await the quiet, responsible, competent, visionary, articulated and conscious growth of a Christian laity. Men and women believers, who are prepared to contribute to the spread of an authentic human development, the strengthening of political and social democracy, the overturning of structures of endemic poverty and the creation of an inclusive prosperity based on lasting reforms capable of preserving the common good. So too, the overcoming of inequality and the preservation of stability, the shaping of models of sustainable economic development that respect nature and the genuine future of mankind, which unfettered consumerism cannot ensure, and the rejection of violence and the defence of peace. One more thing: in this sense, hope must always look at the world with the eyes of the poor and from the situation of the poor. Hope is poor, like the grain of wheat that dies (cf. Jn 12:24), yet has the power to make God’s plans take root and spread. Wealth, and the sense of self-sufficiency it brings, frequently blind us to both the reality of the desert and the oases hidden therein. It offers textbook answers and repeats platitudes; it babbles about its own empty ideas and concerns, without even coming close to reality. I am certain that in this difficult and confused, yet provisional moment that we are experiencing, we will find the solutions to the complex problems we face in that Christian simplicity hidden to the powerful yet revealed to the lowly. The simplicity of straightforward faith in the risen Lord, the warmth of communion with him, fraternity, generosity, and the concrete solidarity that likewise wells up from our friendship with him. I would like to sum up all of this in a phrase that I leave to you as a synthesis, a synthesis and reminder of this meeting. If we want to serve this Latin America of ours from CELAM, we have to do so with passion, a passion that nowadays is often lacking. We need to put our heart into everything we do. We need to have the passion of young lovers and of wise elders, a passion that turns ideas into viable utopias, a passion for the work of our hands, a passion that makes us constant pilgrims in our Churches. May I say that we need to be like Saint Toribius of Mogrovejo, who was never really installed in his see: of the twenty-four years of his episcopacy, eighteen were passed visiting the towns of his diocese. My brothers, please, I ask you for passion, the passion of evangelization. I commend you, my brother bishops of CELAM, the local Churches that you represent, and all the people of Latin America and the Caribbean, I commend you to the protection of Our Lady under the titles of Guadalupe and Aparecida. I do so, in the serene certainty that God who spoke to this continent with the mestizo and black features of his Mother, will surely make his kindly light shine in the lives of all. Thank you. In the annals of the modern papacy, it is essentially unheard of for the same non-liturgical text to be employed by successive Bishops of Rome. There is, however, one exception – and it's rooted in the memory of this very morning. the scene of incredible violence and pain. 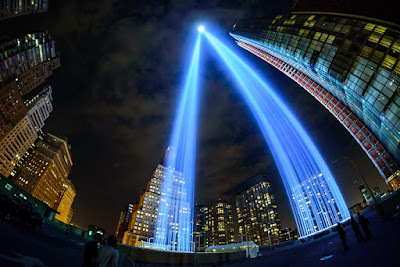 brought them here on September 11, 2001.
suffer from injuries and illness. 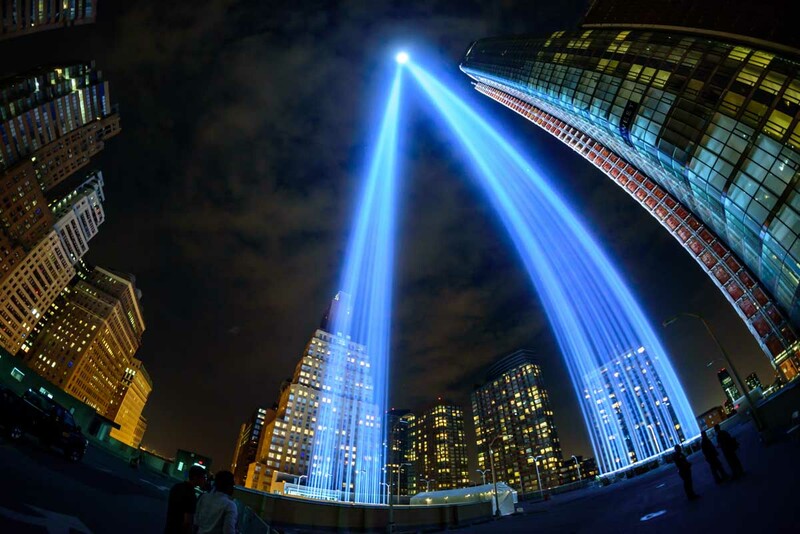 and all who lost loved ones in this tragedy. as our prayer embraces their pain and suffering. "A Heartbreaking Moment" – For US Church, DACA Repeal "Reprehensible"
Upon this morning's announcement that the Trump administration would rescind the Deferred Action for Childhood Arrivals (DACA) program, the US' Catholic leadership has responded with an exceptional degree of fury, its pointedness matched only by the rare united front of church entities which have pushed for months to support the survival of the Obama-era effort protecting some 800,000 undocumented young people from deportation and authorizing them to study and work. The cancellation of the DACA program is reprehensible. It causes unnecessary fear for DACA youth and their families. These youth entered the U.S. as minors and often know America as their only home. The Catholic Church has long watched with pride and admiration as DACA youth live out their daily lives with hope and a determination to flourish and contribute to society: continuing to work and provide for their families, continuing to serve in the military, and continuing to receive an education. Now, after months of anxiety and fear about their futures, these brave young people face deportation. This decision is unacceptable and does not reflect who we are as Americans. The Church has recognized and proclaimed the need to welcome young people: 'Whoever welcomes one of these children in my name welcomes me; and whoever welcomes me does not welcome me but the one who sent me' (Mark 9:37). Today, our nation has done the opposite of how Scripture calls us to respond. It is a step back from the progress that we need to make as a country. Today's actions represent a heartbreaking moment in our history that shows the absence of mercy and good will, and a short-sighted vision for the future. DACA youth are woven into the fabric of our country and of our Church, and are, by every social and human measure, American youth. As people of faith, we say to DACA youth – regardless of your immigration status, you are children of God and welcome in the Catholic Church. The Catholic Church supports you and will advocate for you. From the helm of the nation's largest diocese, while Gomez pleaded for the program's survival in his own name ahead of the White House move, as reports circulated yesterday that President Trump would honor his campaign pledge to eliminate DACA, a group statement from the California bishops – remarkably issued amid the quiet of the Labor Day holiday – preemptively slammed the move as "capricious" and "ill-conceived." "As bishops, every day we see the impact of the failure of a political leadership that washes its hands while immigrants suffer," the Western prelates said. "We choose to continue to serve, comfort, and protect our brothers and sisters," likewise pledging that they would "not allow reckless rhetoric to bully us from the course of compassion and basic decency" – one of several thinly-veiled critiques of the president himself. A defeat for what's arguably been the US church's most concerted issue-advocacy of the Trump era, the fierce response marks yet another prominent break by the nation's largest religious body with a Republican administration that – despite an accord with Catholics on matters of abortion and religious liberty – has been found wanting in church circles for either opposing other top-tier priorities for the bishops, or failing to deliver on its stated goals in cases of agreement (most vividly the case on a broad conscience exemption from the contraceptive mandate in health-care plans). As a similar drivenness to today's comments characterized the church's opposition to the GOP majority's thwarted efforts to repeal and replace the Affordable Care Act, another protracted fight in Congress signals the bench's return as a key arbiter on the acceptability of dueling proposals for DACA's substitute, a standing born both from the historic role of Catholic entities in serving immigrant communities, not to mention the demographic reality that, today, sees Hispanics comprise roughly two-thirds of American Catholics younger than 30 – the very group most affected by today's policy change and the debate now ahead.